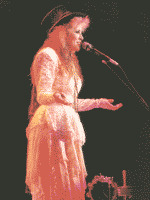 Some of the patterns that I have made are designed to look like Stevie Nicks' clothing. To achieve the Bella Donna look, choose either my Rhiannon top in sheer white chiffon (worn over a body suit) and my Rhiannon skirt in white chiffon, or the 1-piece Rhiannon wrap dress in sheer chiffon. To achieve the Rumours look, choose either my Rhiannon top in black panne velvet with chiffon sleeves and my Rhiannon skirt in black chiffon, or the 1-piece Rhiannon wrap dress in sheer chiffon. To achieve the Bella Donna "blue lamp" look, choose "Dreams" shawl in royal blue lace and fringe. 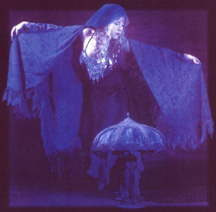 This photo is of Stevie singing "Gypsy" live on the Mirage concert. To achieve this look pair my Mirage blouse/jacket with the Greta skirt. To achieve the look from the Gypsy video, pair the Rhiannon skirt in ivory with the Enchantress jacket in ivory panne & fringe. Specify "Gypsy video length" when ordering jacket. To achieve this look while Stevie sings "Gold & Braid" during the Bella Donna In Concert video, pair up the Rhiannon skirt (just below the knee) and the Dreams shawl in ivory chiffon with gold glitter and ivory panne velvet leg warmers. To achieve the look Stevie had during The Dance video, pair up The Dance top in satin & chiffon with the Rhiannon or Greta skirts. Stevie also wears The Dance top in black burnout velvet with a full-length sleeve. For the White Winged Dove look, order the Dreams shawl in white satin. For leg warmer pants, "leg warmers & pants" link on left toolbar.